Herman W. Howell, son of William Martin Howell and Eva Knight, husband of Hazel Abernathy. Hazel Abernathy, daughter of Linford Abernathy and Ethel Abernathy, wife of Herman Howell. Herman W. (Jake) Howell, 83, of Center Road, Cartersville, died Wednesday May 20, 2000. 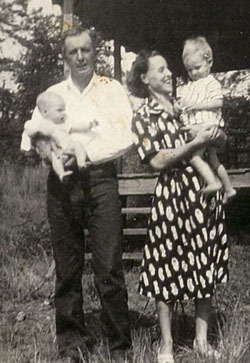 Mr. Howell was born January 21, 1917, in Bartow County, a son of the late William Martin Howell and Eva Knight Howell. He was a member of the Center Baptist Church and retired from the Georgia Department of Transportation. 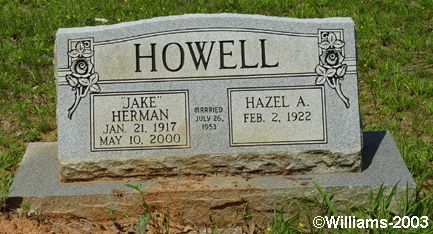 Mr. Howell was preceded in death by his parents, by three brothers, Hubert, Howard and Hoyt Howell, and four sisters, Myrtle Abernathy, Armaretta Shinall, Emogene Brooks and Gertrude Shinall. Survivors include his wife, Hazel Abernathy Howell, four sons, Eugene, Dillard, Donald Howell and Augustus Day, all of Cartersville, one daughter, Carol Hight of Cartersville, six grandchildren, Sandra Webb, Johnny Blasengame, Ruth Day, Lisa Hight and Ryan Hight and Amanda Howell, one brother Harold Howell of Cartersville, and a number of nieces and nephews. Funeral services will be held at 1 p.m. Saturday, May 13, 2000, from the Center Baptist Church with the Rev. Martin Brooks, The Rev. Van Brown and the Rev Charles Howell officiating. Interment will be in the Old Macedonia Cemetery. Pallbearers will be Keith Day, Ricky Blasengame, Randolph Howell, David Howell, Don Grimsley, Lee Blasengame, Henry Williams and Ricky Bryant. Honorary Pallbearers will be Teddy Howell and Lloyd Shinall. Hazel Abernathy Howell, 86, of Center Road, Cartersville, died Tuesday, Sept. 16, 2008. Funeral services will be held Friday, Sept. 19, 2008, at 2 p.m. at Center Baptist Church with Rev. Dewey Atchley, Rev. Martin Brooks, Rev. Roland "Fred" Lee and Rev. Charles Howell officiating. Burial will follow in Old Macedonia Cemetery. The family will receive friends at the funeral home Thursday from 5 to 9 p.m.
Owen Funeral Home, 12 Collins Drive, Cartersville, Ga., is in charge of the arrangements.